My Series Sunday pick is Awakening Mercy, the first book in the Genesis House series by Angela Benson. Awakening Mercy begins with a flashback of the main character. CeCe was 21 years old, a senior in college and unexpectedly pregnant. She was in love with a man who didn't return the love and who certainly didn't want a baby. Fast forward a few years and CeCe is raising a four-year-old boy, working a full-time accounting job that paid part-time wages and selling real estate as an additional source of income. CeCe really doesn't have the energy or time to serve the court-ordered 150 hours of community service at the Genesis House, an African-American Christian charity located in Atlanta. Thirty-three-year-old Nate Richardson is the director of Genesis House and a divorcee. His ex-wife just became another man's wife. Needless to say, this news occupies his thoughts. Falling in love again is the furthest thing from Nate's mind. In fact, both characters are reluctant to open their hearts after being treated so badly in past relationships. Sub-characters include the fashionable 65-year-old Miss Gert "B.B." Brinson who is CeCe's roommate, Anna Mae, Stuart, Shay and Marvin (the married couple who separated while trying to deal with the loss of a child). Every single character has a back story that doesn't overshadow the other characters' lives. I hope the next books in the Genesis House series will highlight more of the circle of friends personal trials and triumphs. I didn't even realize this book was so lengthy (at 550 pages). A definite page-turner. 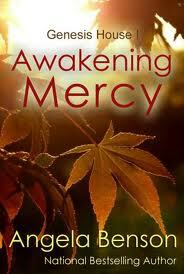 Awakening Mercy is inspirational. It is about a person's journey back to God and building a spiritual relationship. Forgiveness plays a major part and is a lesson that we can all stand to be reminded of. Prayer is mentioned often, also classifying it as Christian fiction. This book is a mix between the Blessings series by Beverly Jenkins and the Reverend Curtis Black series by Kimberla Lawson Roby. If you are a fan of either series, you will enjoy the work of author Angela Benson. Thanks to Twitter friend Brooks who suggested this good read!